In a world where multilocation enterprises are embracing cloud applications for even the most sensitive, mission-critical tasks, and where video and mobile communications have become the norm, the demand for reliable, high-performance bandwidth and wide-area networking (WAN) is greater than ever before. But businesses often find themselves relying on legacy WAN network solutions, which often can’t scale up quickly or cost-effectively to meet the needs of an always-on, on-demand business. At the same time, the perimeter of the cloud-native enterprise is much more fluid than that of the WANs of the past, meaning that modern-day business infrastructure is often too complex and multifaceted to manage and support efficiently with traditional “hub-and-spoke” solutions. Fortunately, software-defined WAN (SD-WAN) technology has burst on the scene, offering today’s digital enterprises a compelling way forward. SD-WAN utilizes bandwidth more efficiently and economically, optimizing the WAN infrastructure to lower costs while increasing application and network reliability and performance. Thanks to the elegance of the solution – and the positive business outcomes that it delivers – SD-WAN has been gaining in popularity, and new choices are flooding into the market all the time. As of July 2018, there were 40+ offerings in the market. Adoption is ramping up: 360iResearch expects the global market to grow from $843 million in revenue last year to $15 billion by the end of 2024, at a whopping CAGR of 51 percent. In a recent Frost & Sullivan SD-WAN report, market revenue in North America alone exceeded $300 million in 2017. About 7 percent of enterprise IT decision-makers said they have deployed SD-WAN; and about a quarter (23 percent) of them said they plan to deploy SD-WAN in the next 12 to 24 months. Amid all of this activity, AireSpring is fulfilling its mission to be a best-of-breed resource for multilocation enterprises. Its Platinum SD-WAN package is built to deliver a tailored, managed solution with an array of differentiating aspects providing superior performance, versatility and savings. 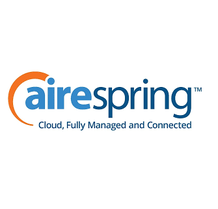 It’s important to AireSpring to ensure that businesses get the right SD-WAN package for their needs: call it SD-WAN without limits.